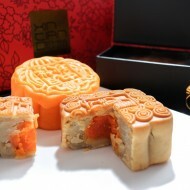 Mooncakes are Chinese delicacy part of the custom during the mid autumn festival. 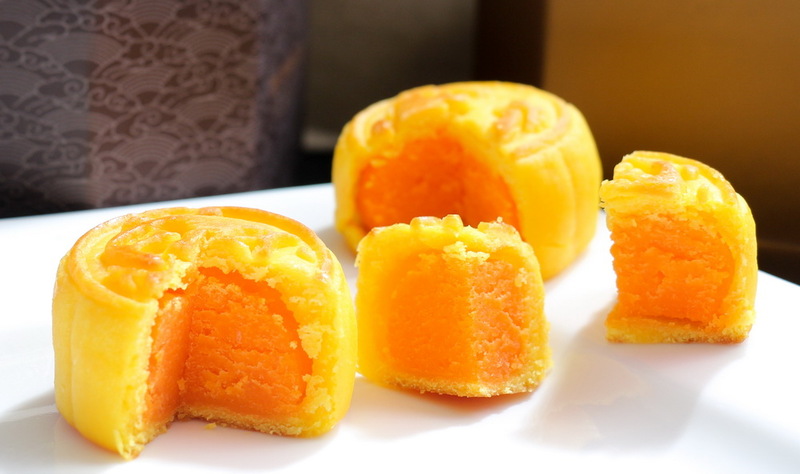 They are mostly sweet and come in a variety of fillings. 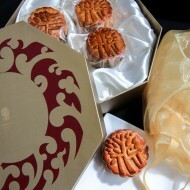 It is considered labor intensive, time consuming and difficult to make a perfect one. 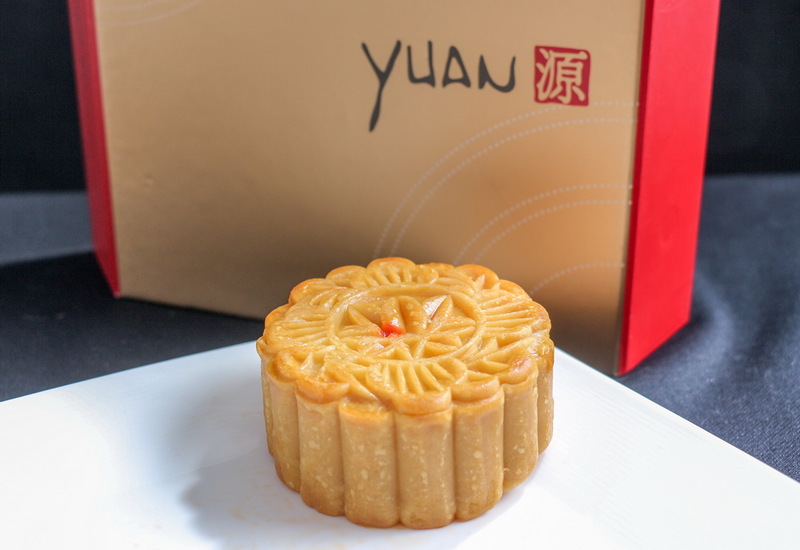 There are many restaurants and outlets that provide these calorie intensive savories with varieties of different packaging. 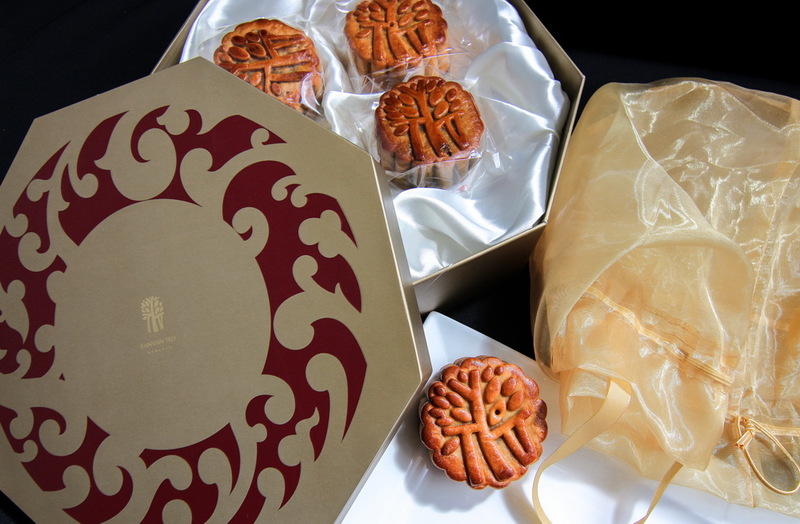 It is meant to be shared with family members and relatives. 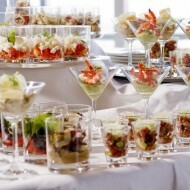 It is also a good occasion to use it as a gift to business partner and clients. 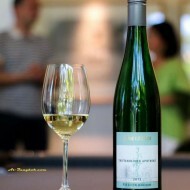 Apart from the taste the packaging is another main consideration when people are buying. 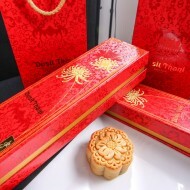 With the new packaging ideas and design, it is a perfect gift to impress. This is where it becomes fun to give and do some shopping around. 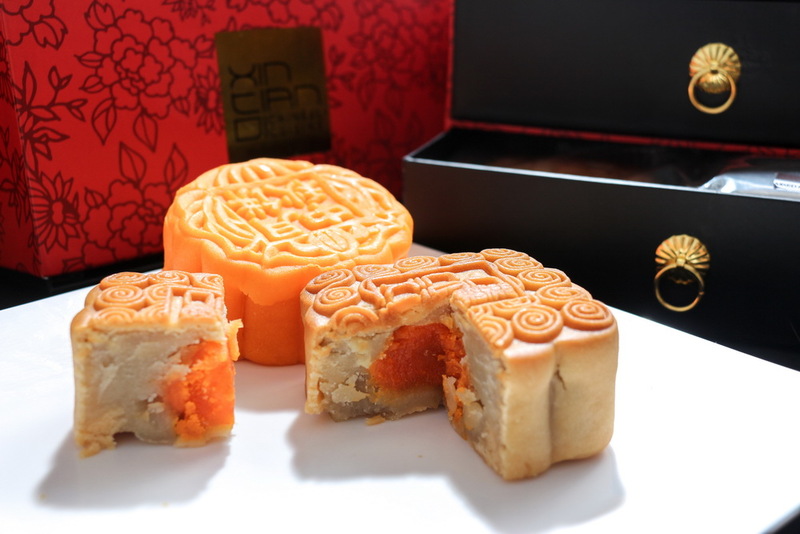 Let’s look at some of the mooncakes that are offered by Bangkok top Chinese restaurant. 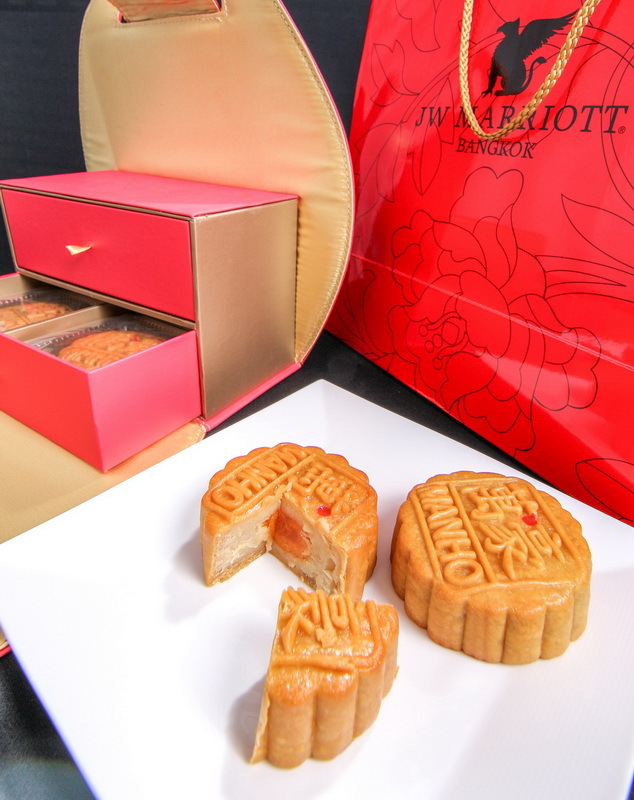 Their mooncakes are packaged in red and gold narrow boxes of 4. 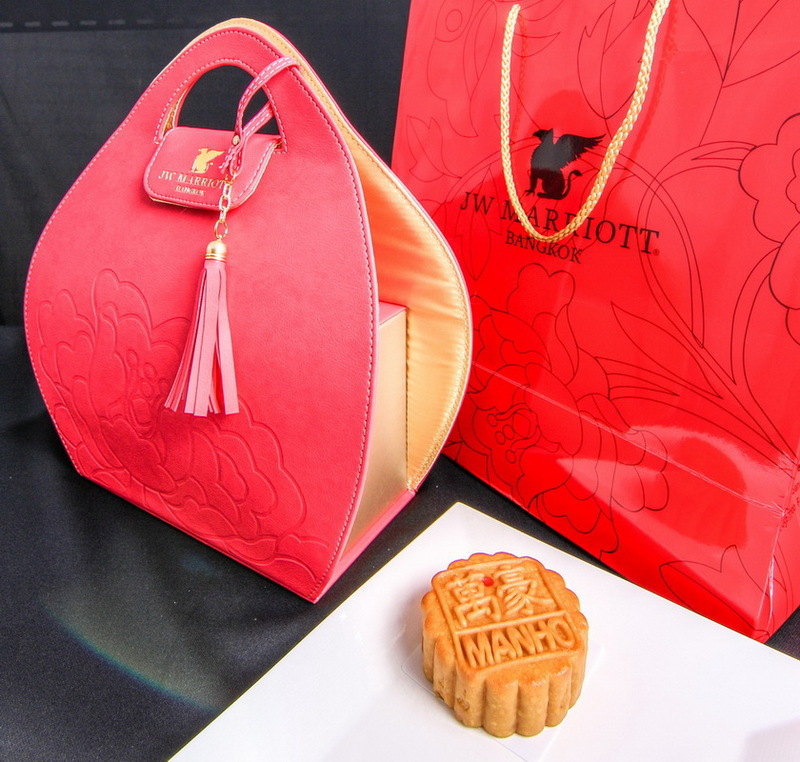 It comes with paper matching handbag. 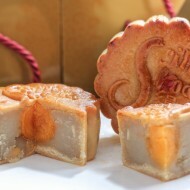 Fillings offered are: lotus seed, durian, custard, Chinese red dates, mixed nuts, and green tea, each one weight at 170 grams. 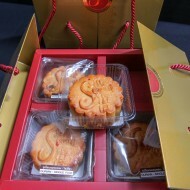 They are 160 baht each, boxes are provided for 2, 4, or 8 pieces. 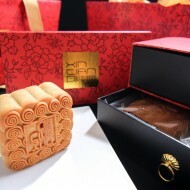 The mooncakes are in a small purple brown with gold Chinese water print square box with cut corners fill with 8 pieces. 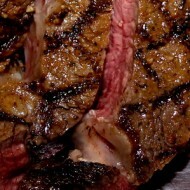 It contained 2 layers of 4 pieces. 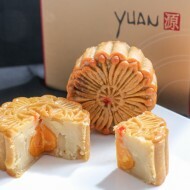 The mooncakes are bite sizes; one piece can be a big mouth full. 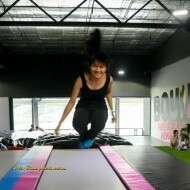 It was the smallest even compared to the mini version from other venues. 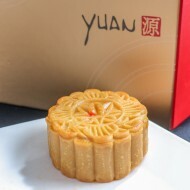 The shell was also different flaky and light. 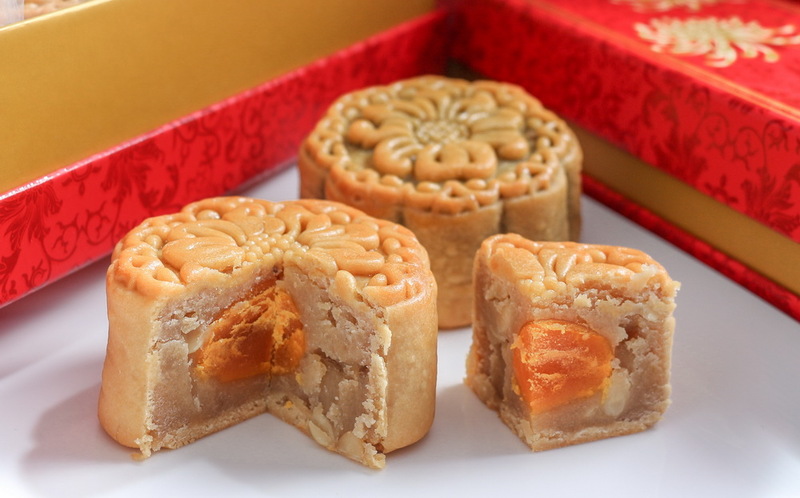 Fillings are lotus seed and custard. 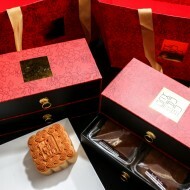 Box of 8 is priced at 580 baht, box of 6 is priced at 480, and special limited edition one piece is 140 baht. 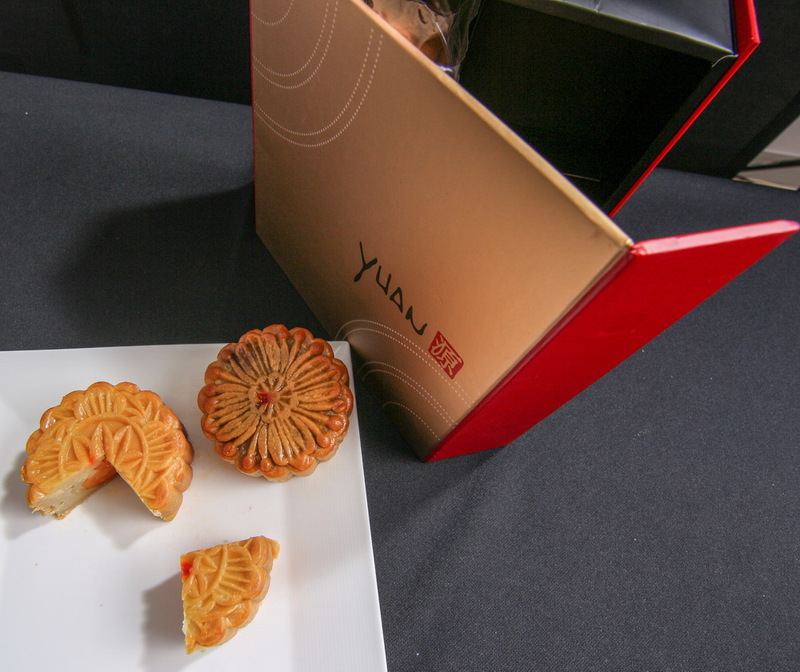 The 4 pieces come in a box of gold and red. 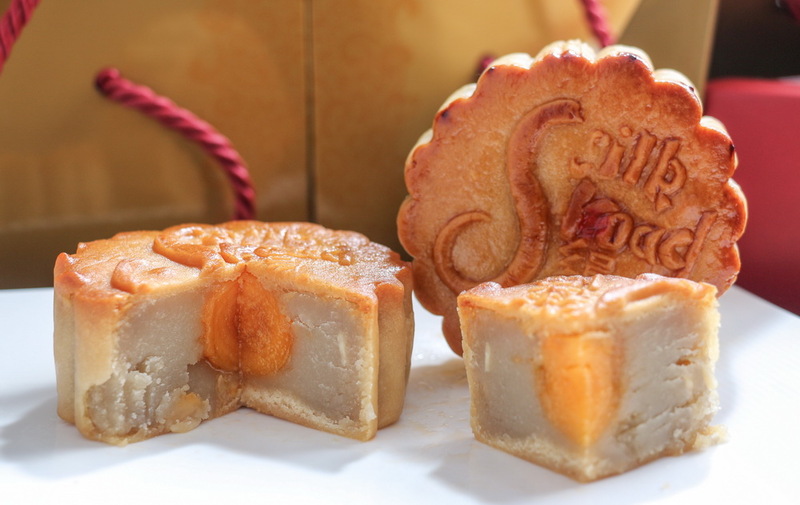 Fillings offered are: lotus seed, durian, custard, mixed fruits and nuts, red bean and custard, each one weight at 130 grams. 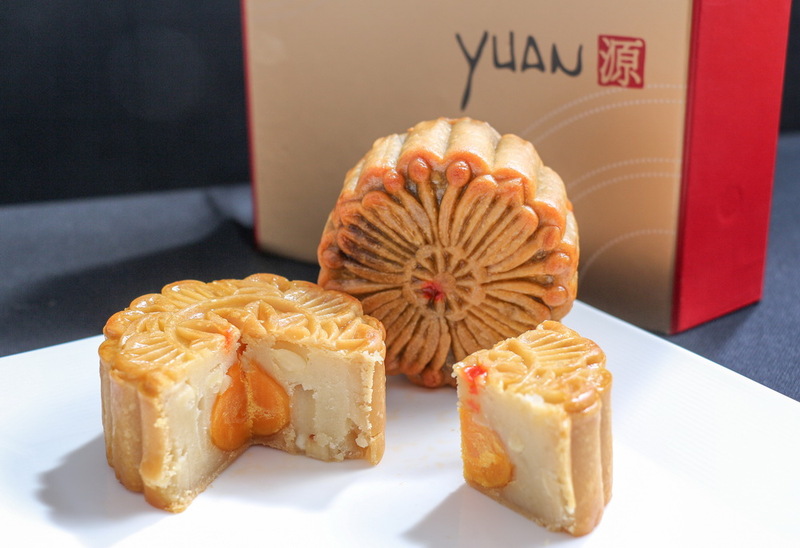 The mooncake was a too moist making the shell a bit clay like. 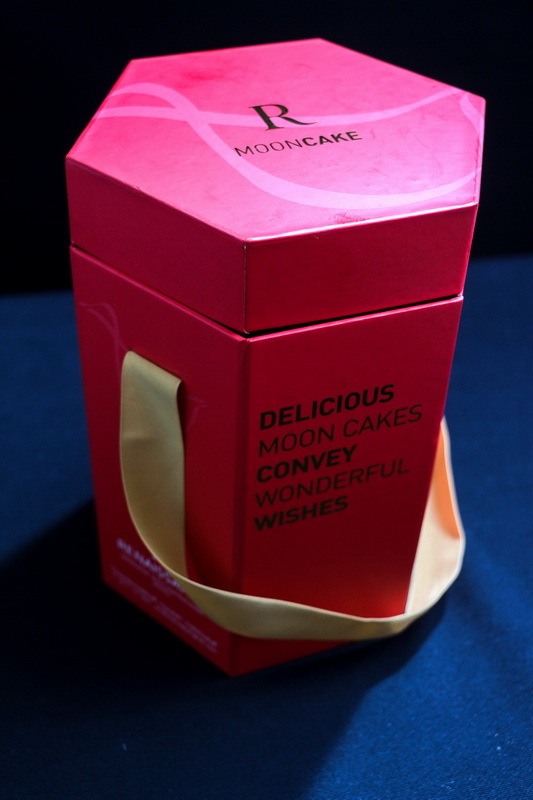 They are 160 baht each, boxes are provided free for 2, 4, or 8 pieces. 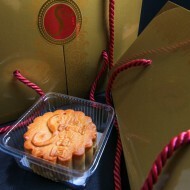 The 8 piece mini (60 grams) is price at 680 baht. 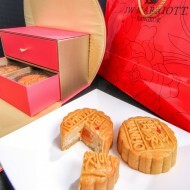 The 4 mooncakes come in gold and red box which open from the top and has magnetic thing to keep it closed. 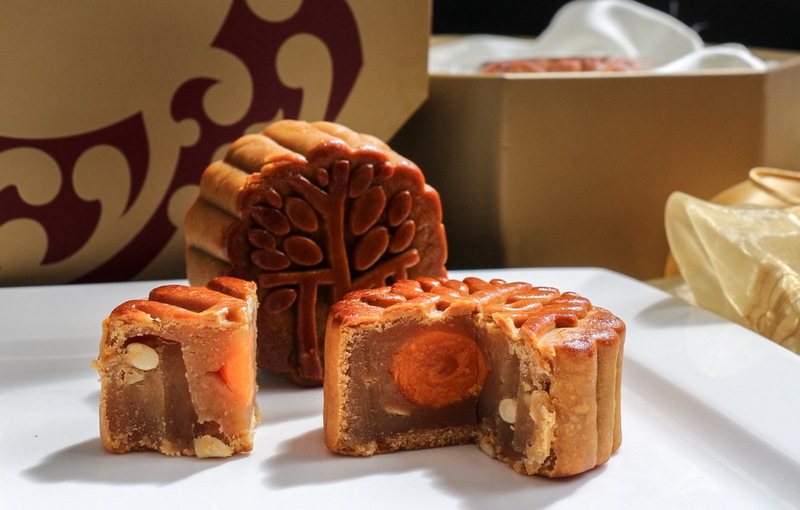 Fillings offered are: lotus seed, durian, custard, red bean, Chinese red dates, and mixed nuts. 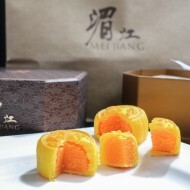 For a box of 4 is priced at 588+ baht. 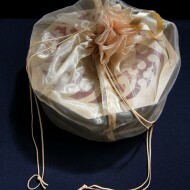 Another option is a silk box of 4 priced at 788+ baht. 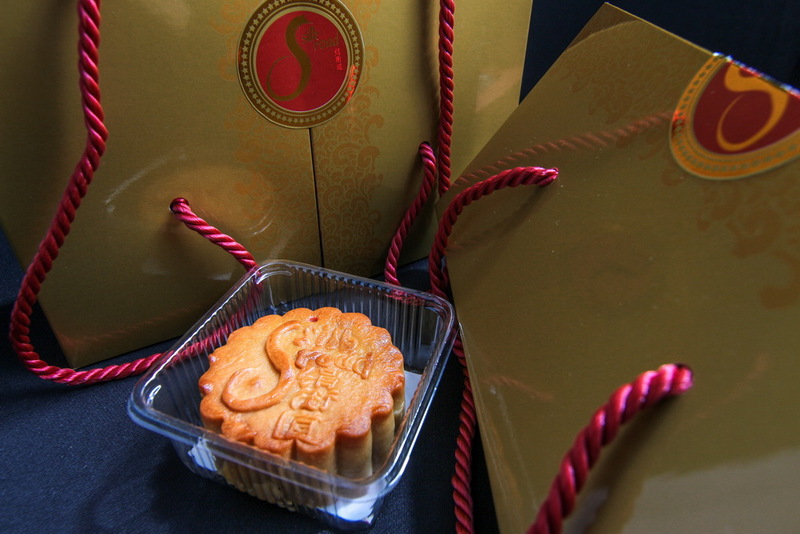 4 piece octagon shape box looks impressive in a gold semitransparent bag. 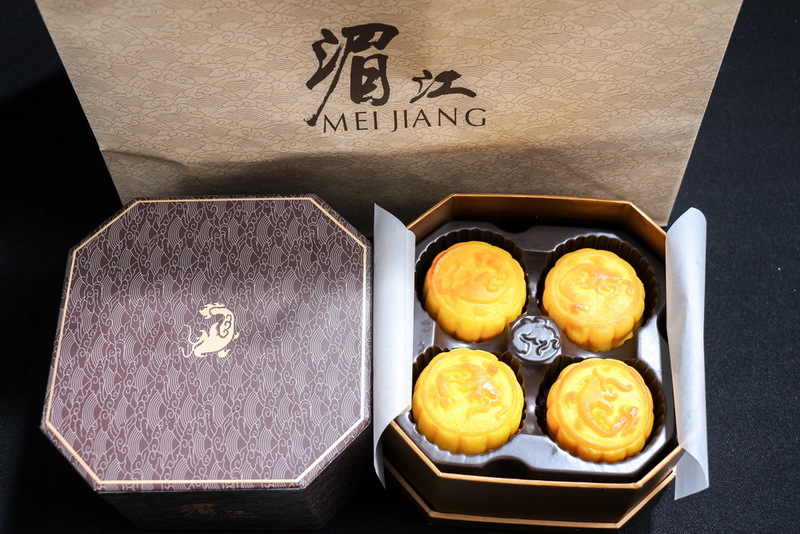 Fillings offered are: lotus seed, durian, red bean, black sesame, mixed nut and custard. 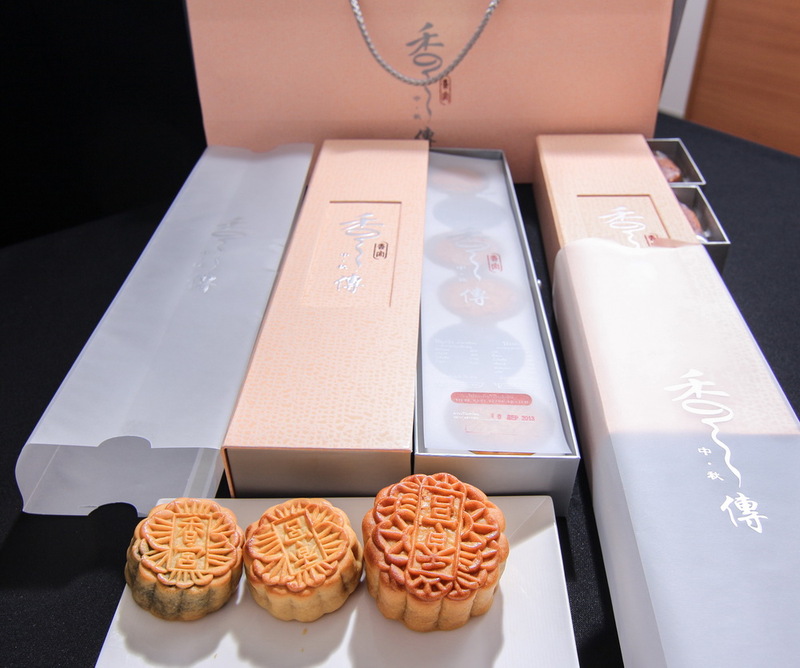 They are 160 baht each (weights 190 grams) includes a cardboard box, premium boxes of 4 are 760 baht. 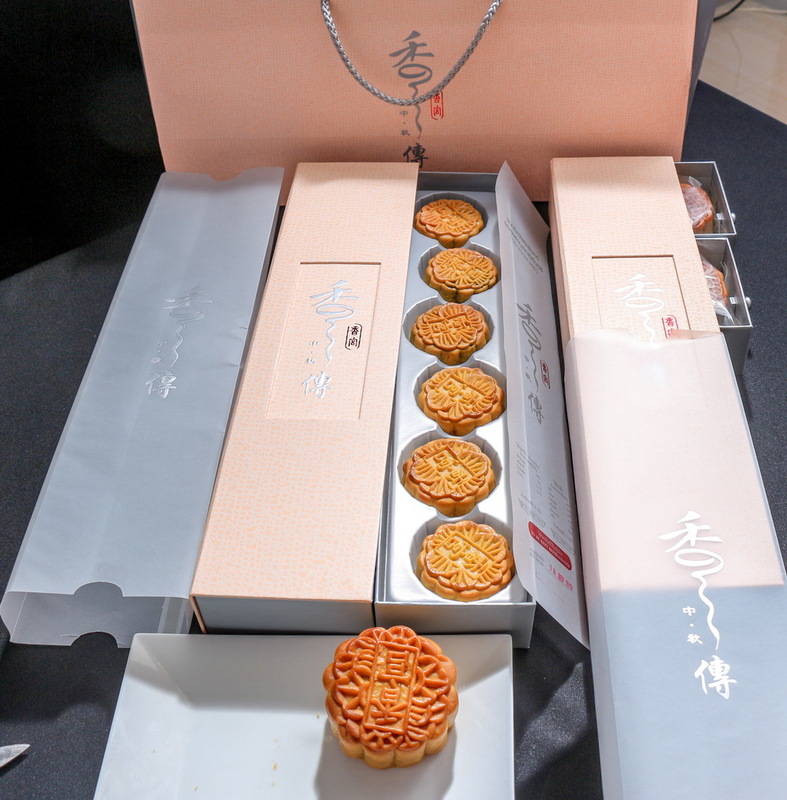 4 piece set comes in a unique hexagon shape box which opens on the side. 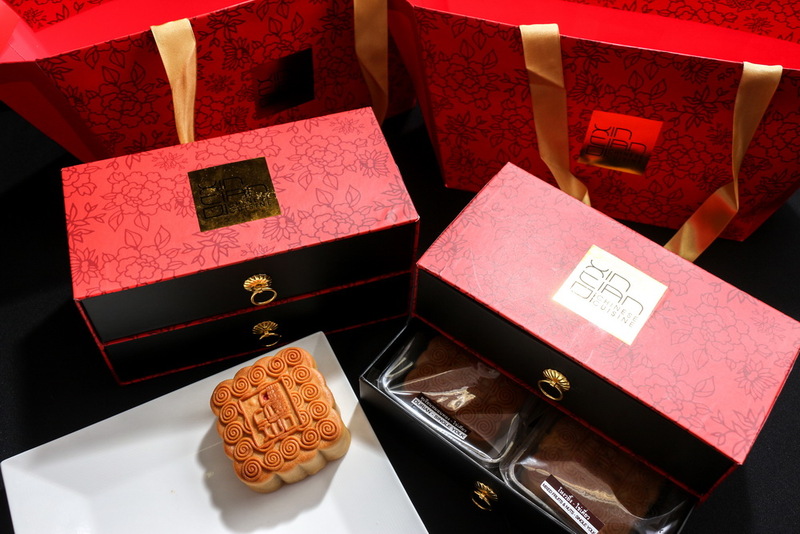 Fillings offered are: lotus seed and coffee, durian, Chinese dates and green tea, mixed nuts and macadamia lotus seed. 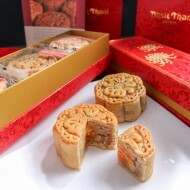 They are 150 baht each; hexagon boxes of 4 are 799 baht. Their Version comes in an over scale pink and grey box. Making the box bigger does make it look more impressive. 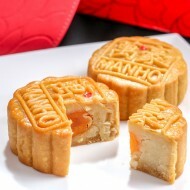 There are 2 versions regular size and mini size. 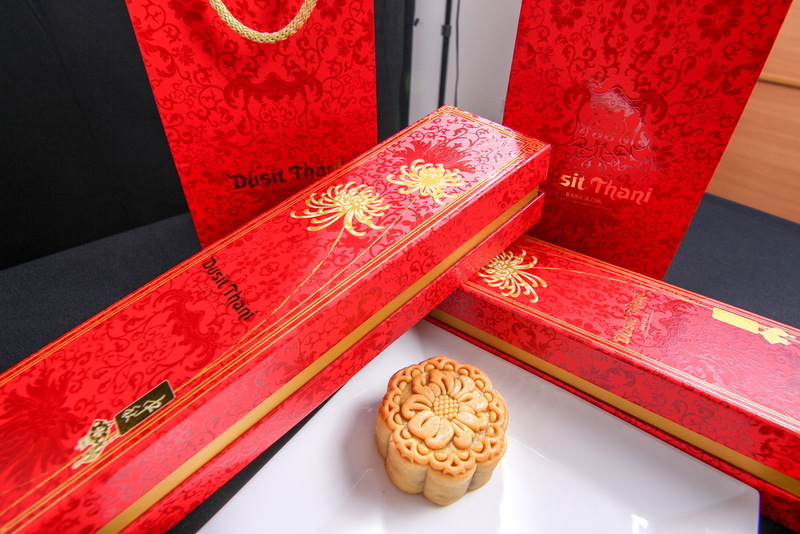 The one in the photographs are regular size 4 piece box (548 baht) one drawer per piece and the mini size 6 piece boxes (528). 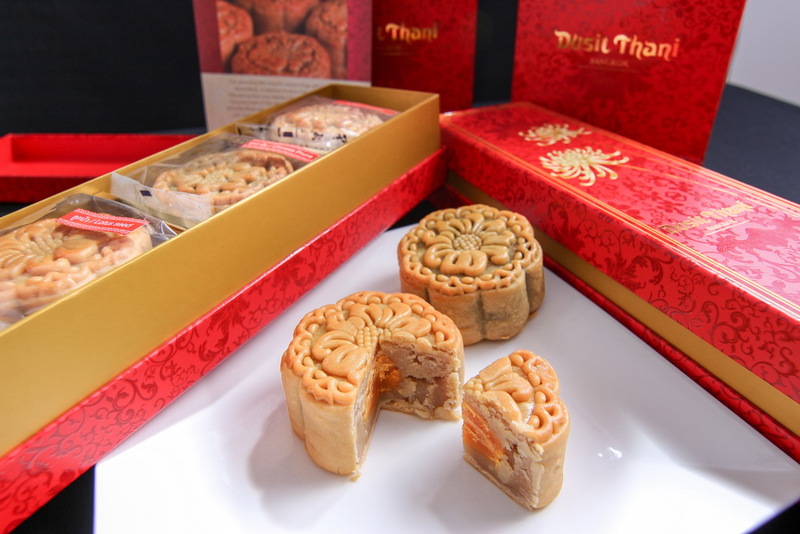 Other options are 6 piece box 1288 baht, 8 piece box 1328 baht and 8 piece circular shape box for 1988 baht (no option for separated piece). 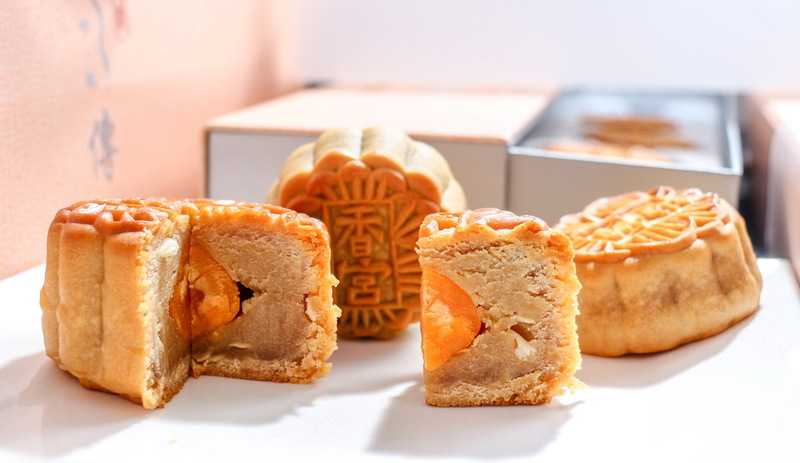 Fillings offered are: lotus seed, durian, red bean, black sesame, mixed nuts and low sugar lotus seed (only available in mini size). 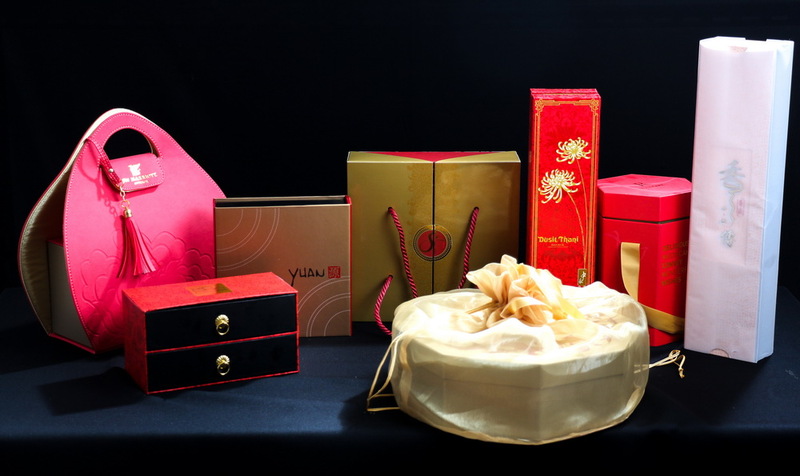 An elegant red and gold box with drawers of 4 pieces and a matching bag will impress anybody who receives it. 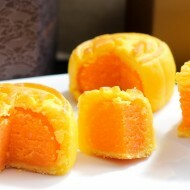 Fillings offered are: lotus seed, durian, mixed nuts, custard and chilled cappuccino. They are 150 baht each for chilled cappuccino is 180 baht. 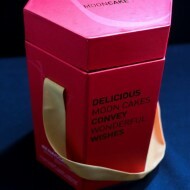 For boxes, 2 pieces are additional 150 baht and 4 pieces are additional 250 baht. 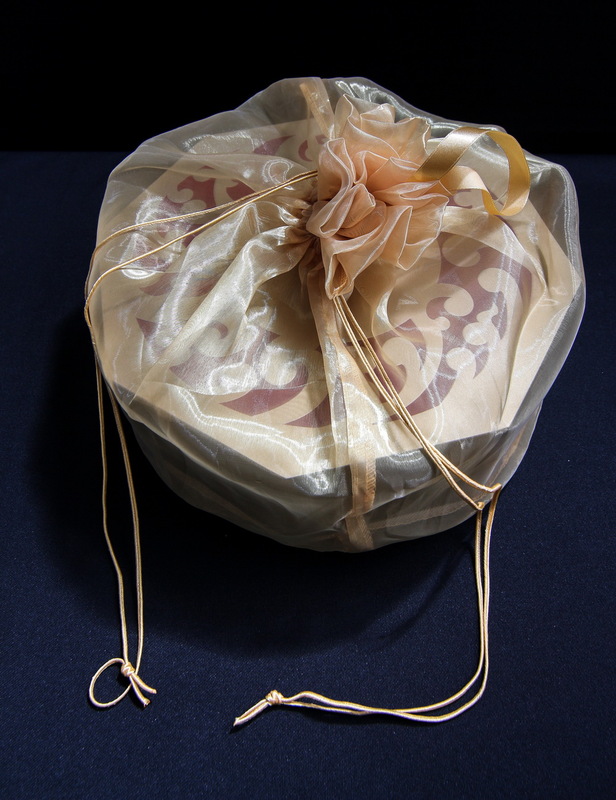 The packaging comes as a magnificent pink purse. 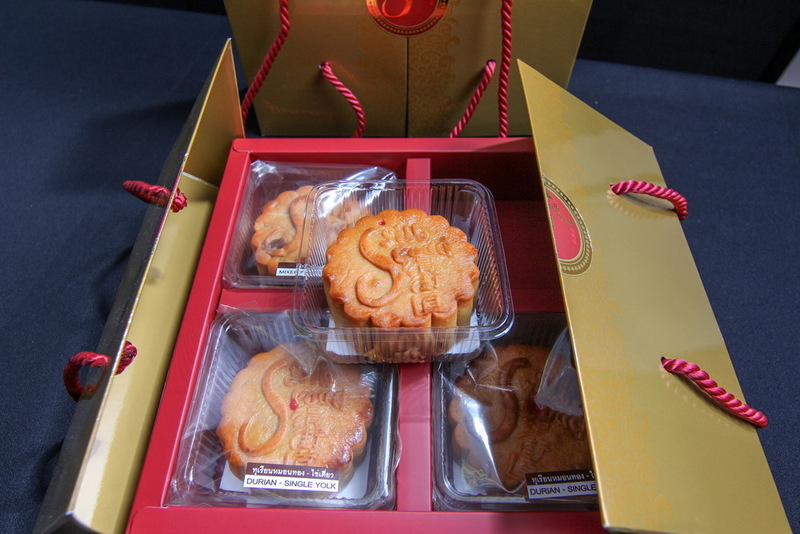 Inside are drawers keeping 4 pieces of moon cakes. 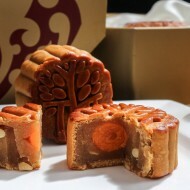 Fillings offered are: lotus seed, durian, red bean, Chinese red dates, mixed nuts, green tea, ginkgo nuts and chestnuts. 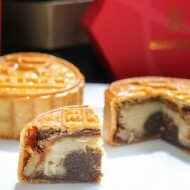 The mooncake itself had a firm form, after slicing into it; it still maintained the shell intact with the filling. 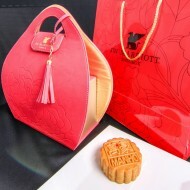 The pink purse with 4 pieces cost 799 baht (each one weight at 160 grams per piece is 145 baht). 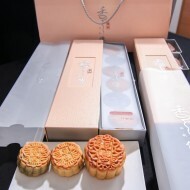 Eight pieces mini size come in a box priced at 599 baht. 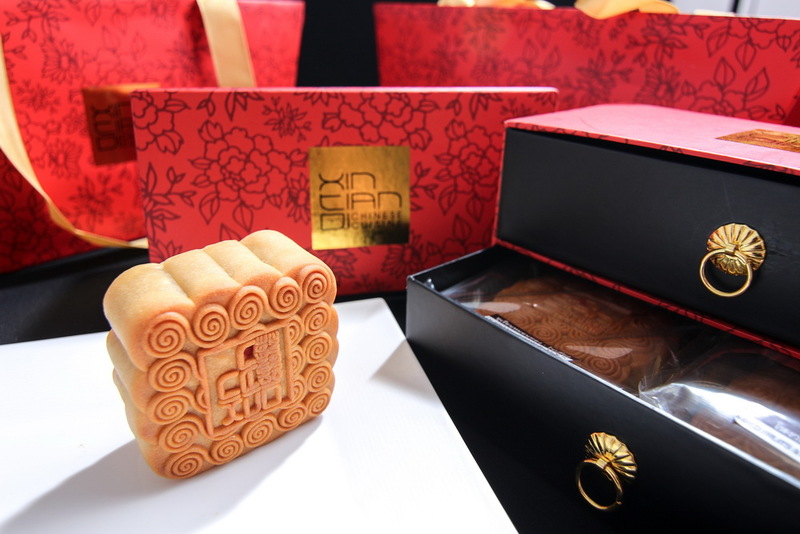 With so many fillings some are traditional some are very creative, to have fair comparison between each versions of the mooncakes. 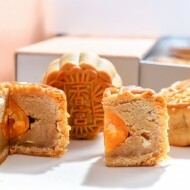 We settled with the lotus seed which is the most common filling and we guess it is the most popular. 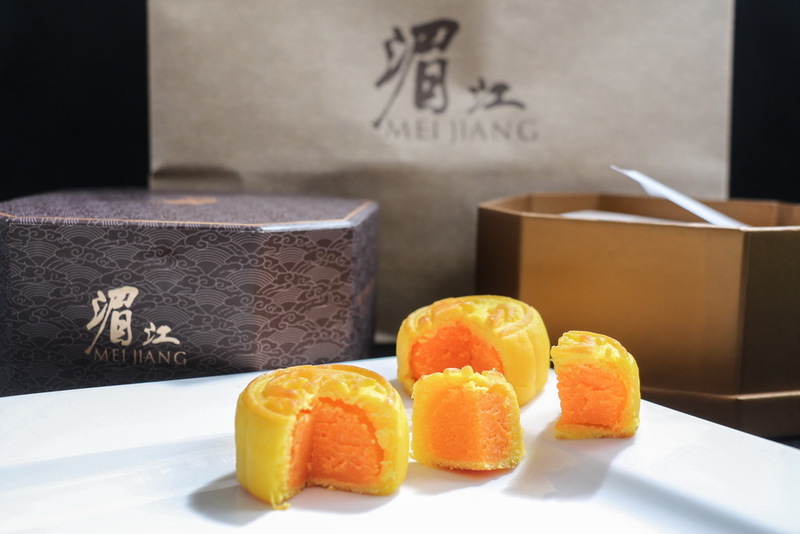 From four judges with 3 considerations of taste, texture, and aroma; the ones we like not in any particular order are from Dusit Thani, Plaza Athénée, Hilton Millennium, and JW Marriott. 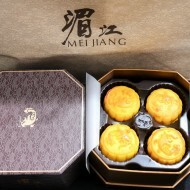 There are some creative unique fillings worth to mention which are; chilled cappuccino from Crowne Plaze, Egg custard from the Peninsula and lotus seed and coffee from Renaissance. 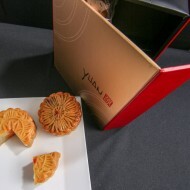 For packaging, the ones that are unique in terms of design are; Shanri-La, Renaissance, Crowne Plaze, Banyan Tree and JW Marriot. 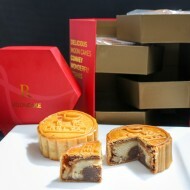 The mooncakes featured in this article are among the top grade selection. 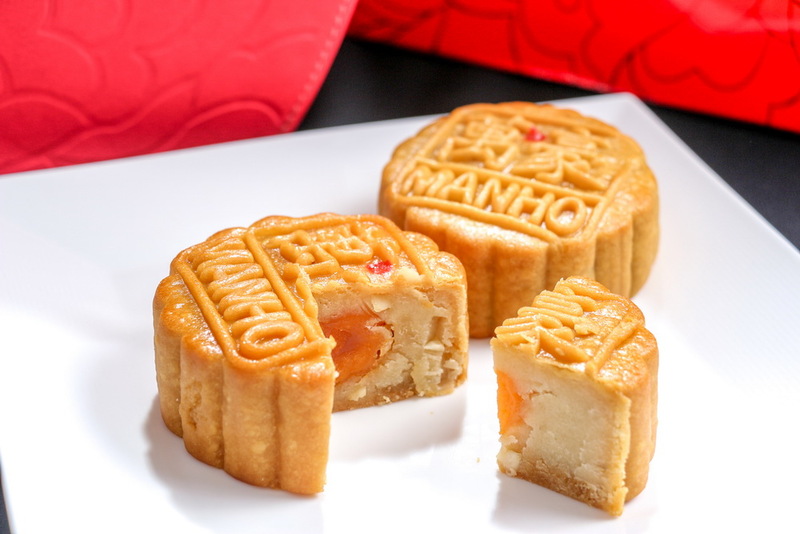 We aware that there are many other mooncakes available from other restaurants, hotels and the more common ones sold in supermarket. 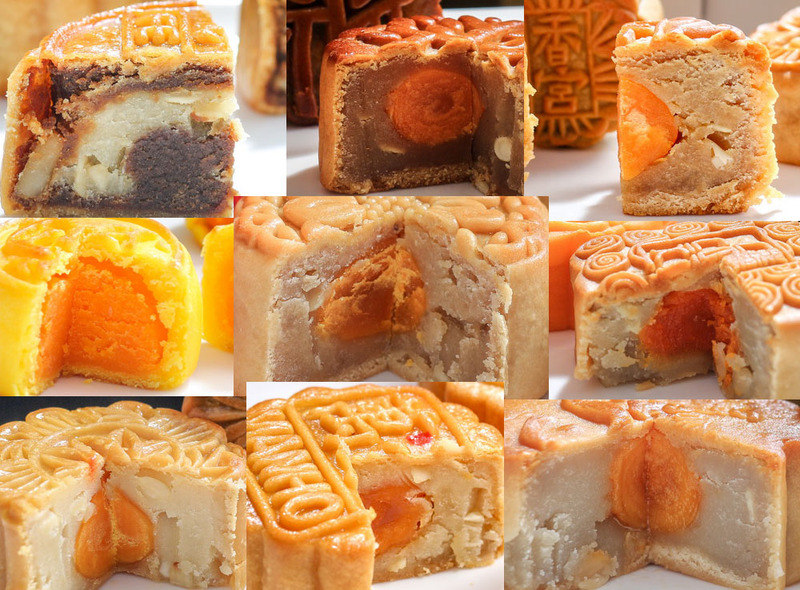 Do let us know which ones you like in the comment box. 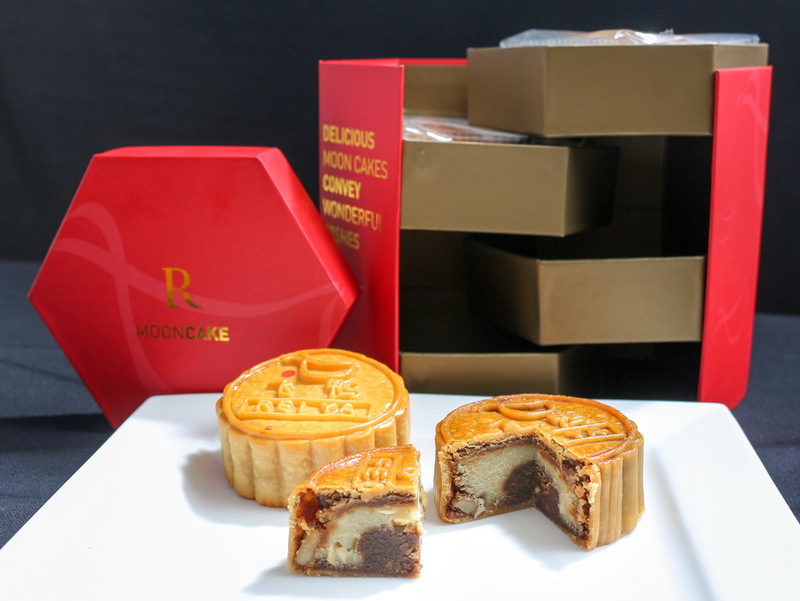 This ends the round up of Premium Mooncakes in Bangkok. 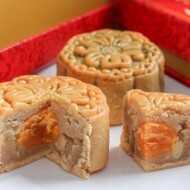 We wish you happy Mid-Autumn Festival and hope you take part in this tradition even if, it is just by having a mooncake. 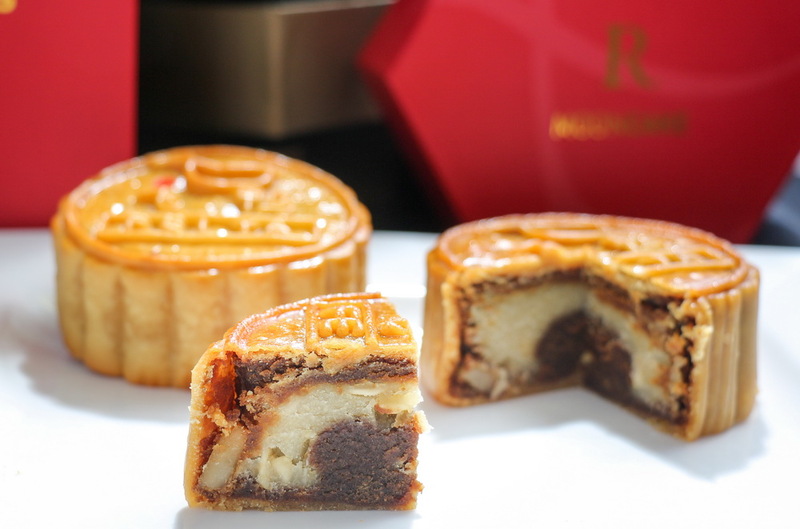 And we hope you succeed in giving the most impressive mooncake to your family, relatives and clients.